Japanese Episode DP 164: "Potchama Goes Astray!" American Episode 1307: "Piplup, Up and Away!" Satoshi has stopped on his road to Nagisa City to train his Fukamaru. The pokemon's attempts to use Meteoric Swarm all end with the attack hitting Potchama, and the little penguin pokemon has had enough. Much to its dismay, however, neither Satoshi nor Hikari seem to care! Feeling as if no one is concerned about its well-being, Potchama quietly leaves the group to head back toward Nanakamado-Hakase's laboratory. The Rocket-Dan spot Potchama and quickly hatch a scheme to gain its trust so it can help them capture Pikachu. Potchama tells the disguised trio its story, causing the trio to abandon their plans to track down Satoshi and his friends to give them a piece of their mind. In the middle of their lecture to Satoshi-tachi, a rampaging Dosaidon appears and separates Pikachu from the group. Now that the number of missing pokemon has increased, Satoshi and his friends step up their search efforts. Without warning, Fukamaru launches Meteoric Swarm into the forest! Everyone guesses that the attack will guide them to Potchama's location, so they follow its path. Sure enough, Satoshi-tachi finds Potchama and Pikachu in a cage set up by the Rocket-Dan. After seeing how much its trainer cares about it, Potchama learns how to use Hydro Pump and uses the attack to send the Rocket-Dan blasting off. After the battle, Hikari and Satoshi apologize to Potchama and promise to be more considerate in the future. Now that Potchama's problems are solved, our heroes set out on the final stretch to Nagisa City. I'm really going to miss Hikari's Potchama. This is one of those episodes that I can't imagine being successful with any other pokemon. Who else could have filled in for the little penguin in this episode? I'm trying to think of a monster in the group's possession who can be serious enough to have the emotional issues that Potchama has while still being an entertaining comic relief, but I can't think of any. There's just so much to praise about this episode that I'm a little apprehensive to start listing things because I'm afraid I'll miss something. The animation, the music, the random Dosaidon, Hydro Pump...I could go on and on. This is a great episode, from start to finish, and it's really difficult for me to come up with anything bad to say about it. When people think back to the funniest episodes in Diamond & Pearl, this one will stand out above all the others. It's that good. 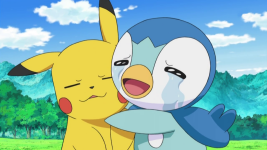 I always sort of dread episodes centered on Piplup because of how much I dislike the voice it's been given in the dub, and this episode didn't really do much to change that opinion. On the bright side, the writers actually kept the annoying Team Rocket-isms to a minimum this time around and offered a comparatively refreshing script. While the music being changed is still a problem, having an accurate script for once is a really nice distraction to have. Ash: "Now! Special trainin' with Gible!" Brock: "Sounds like a good idea. It's a good time to work on Draco Meteor." Originally, Takeshi says "Oh yeah! Fukamaru still hasn't learned how to use Meteoric Swarm yet!" in this tone that almost sounds like he's talking down to us. Almost every episode that's been made since the pokemon's been captured has started with it practicing Meteoric Swarm, Takeshi. We don't need your condescending reminders. The dubbed version doesn't talk down to us so much, so +1 for the TPCI, I guess. Jessie: "Can you read the fine print?" Musashi asks Potchama if it can read (as in, "you're not illiterate, are you? "), a line that amuses me so much more. You're probably wondering (or maybe not?) about the part where Team Rocket is explaining what they do. Doesn't it seem a bit rambly? Why do they keep bringing up the cardinal directions? What's with that rain / wind / snow stuff at the end? The reason for all these seemingly random elements coming together the way they do is because the Rocket-Dan is doing a parody of a poem by Miyazaki Kenji (宮沢賢治) entitled "I Will Not Succumb to the Rain" (Ame ni mo makezu, 雨ニモマケズ). Several parts of the poem are mimicked by the Rocket trio, rewritten, rearranged, or otherwise redone. (行ツテ看病シテヤリ) Go and nurse it back to health. (行ツテソノ稲ノ束ヲ負ヒ) Go and carry the bundles of rice for her. (行ツテコワガラナクテモイイトイイ) Go and tell him that there's no need to be scared. (ツマラナイカラヤメロトイイ) You should stop it because it's trivial. Jessie: "Out west, if a Pokémon has been cast aside by their Trainer, we're there! Quick as a flash! We locate that trainer and attempt to talk sense into the misguided one." James: "And out east, if there's been a mean-spirited Trainer who takes their Pokémon for granted, we're there as well! We go with that Pokémon and teach said trainer exactly what they need to know to become a better Pokémon person." Meowth: "Down south, if there's a hungry Pokémon pathetically pining for some long overdue grub, we are there! We deliver mountains of munchies!" Jessie: "And up north, if a Pokémon and its Trainer have had a bit of a tiff, we're there too! We listen to both sides and then advise them on making nice." There's a clear parallel between the north and south parts of the poem and the north and south parts of the Rocket-Dan's speech. The east and the west parts are a bit different, but I think the overall intent is still the same. I won't succumb to the rain. I won't succumb to the wind. I won't succumb to the snow or the summer's heat. Musashi: "I won't succumb to the rain,"
Kojirou: "Fuyu no samusa ni mo makenai"
Kojirou: "Or the cold of winter." Rocket-Dan: "Sou iu o-tasuke i'inkai ni wa watashi-tachi wa naritai!" Rocket-Dan: "We want to become a rescue committee like this." So why would the writers randomly pay homage to a poem written in the 1930s (if this page is to be believed)? I'm not entirely sure myself, but if I had to guess, it would be because of the poet's work helping people. Maybe the writers of the TV show were trying to make a connection between Mr. Miyazaki trying to help people and the Rocket-Dan's attempt to help people? Or maybe they felt that Mr. Miyazaki, who gave up a life of luxury to be free, was similar enough to one of the Rocket members that an homage would work? I don't know if we'll ever find out the real reason, but I thought this whole sequence makes for some interesting trivia nonetheless. This episode has a weird little video oddity that occurs during the above explanation. For whatever reason, the dub removes the little transition between the seventh and eighth slides. 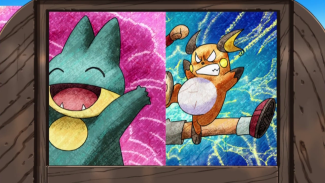 Instead of sliding away like all the other cards, the image flashes back and forth a few times before finally settling on the image of the trainer and his Raichu fighting. Could there have been some problem with TPCI's master of the episode or something? Or was this an edit done by TPCI. And if so, why? Nyasu's translation of Potchama's dialogue is in the first person, while Meowth's translation of Piplup's dialogue is in the third person. Jessie: ""What's going on?" is certainly not you." James: "When it comes to disguises, you haven't a clue." Meowth: "Your brains are goo!" Jessie: "When the moon is full, we're haunting your dreams." James: "We've fooled you each time with the simplest of schemes." In the Japanese version, the Rocket-Dan just recites their normal motto.